Haq's Musings: Imran Khan To Obama: Leave Afghanistan! Famous Pakistani cricketer-turned-politician Imran Khan has written an open letter to President Barack Obama urging him to withdraw US and NATO forces from Afghanistan. The letter was published by Forbes magazine on January 29, 2009. In addition to being a celebrity in the cricket-playing world, Imran Khan is a philanthropist and an idealist whose political party, Tehreek-e-Insaf, has not been able to find much traction among the average Pakistanis. 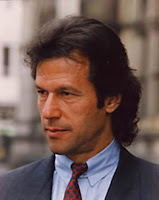 Pakistan's political system, dominated by the feudal and tribal leaders, is rigged against leaders such as Imran Khan. Based on all the recent polls, however, Imran Khan's views on Afghanistan appear to reflect popular opinion in Pakistan which is overwhelmingly against the US presence in the region. It is the elected leadership that is out of step with the vast majority of Pakistanis. Imran Khan reminds me of Ralph Nader. A recent documentary titled "The Unreasonable Man" chronicles the life of Ralph Nader. The title "The Unreasonable Man" comes from a famous quote attributed to the early 20th century British playwright George Bernard Shaw who said, "The reasonable man adapts himself to the conditions that surround him... The unreasonable man adapts surrounding conditions to himself... All progress depends on the unreasonable man." Like Nader, Khan is a well-meaning, well-respected, and honest political leader bringing out the issues of democracy, transparency, freedom from political corruption, civil rights and rule of law, that the mainstream parties do not particularly care about. But the presence of Imran Khan on the Pakistani political scene does offer hope for the future. To an average Pushtun, notwithstanding the U.N. Security Council sanction, the U.S. is an occupying power in Afghanistan that must be resisted. It is as simple as that. Therefore, the greatest challenge confronting U.S. policy in Afghanistan is how to change its status from an occupier to a partner. The new U.S. administration should have no doubt that there is no military solution in Afghanistan. As more innocent Pushtuns are killed, more space is created for new Taliban and even Al-Qaida recruits--revenge being an integral part of the Pushtun character. So, as with Iraq, the U.S. should give a time table for withdrawal from Afghanistan and replace NATO and U.S. forces with U.N. troops during the interim period. The Pushtuns then should be involved in a dialogue process where they should be given a stake in the peace. As the majority's stake in peace grows, proportionately the breeding ground for extremists shrinks. The crucial lesson the U.S. needs to learn--and learn quickly--is that you can only win against terrorists if the majority in a community considers them terrorists. Once they become freedom fighters and heroes amongst their people, history tells us that the battle is lost. The roots of terror and violence lie in politics--and so does the solution. We urge the new administration to conduct a major strategic review of the U.S.-led war on terror, including the nature and kind of support that should realistically be expected of Pakistan keeping in mind its internal security interests. Linking economic assistance to sealing of its western frontier will only force the hand of a shaky and unstable government in Pakistan to use more indiscriminate force in FATA, a perfect recipe for disaster. The stability of the region hinges on a stable Pakistan. Any assistance to improve governance and social indicators must not be conditional. For the simple reason that any improvement in the overall quality of life of ordinary citizens and more effective writ of the state would only make mainstream society less susceptible to extremism. However, if the new U.S. administration continues the Bush administration's mantra of "do more," to which our inept leadership is likely to respond to by using more force, Pakistan could become even more accessible to forces of extremism leading to further instability that would spread across the region, especially into India, which already faces problems of extremism and secessionist movements. Such a scenario would benefit no one--certainly not Pakistan and certainly not the U.S. That is why your message of meaningful change, Mr. President, must guide your policies in this region also. great persons take great amount of time.Nelson madela got success after 40 years.Though Imran has not got much success but surely his popularity is growing.IshahAllah,one day he will be in power. good post riaz but when did u change ur allegiance from mqm to tehreeki insaf. Sealing the border is something that can never be done. The mountains along the Durand Line present no clear boundaries. The question to ask is why are the Pashtuns divided by an artificial frontier, and why do they not have a unified political voice. Even inside Pakistan, Pashtuns are split into NWFP, FATA, the northern areas of Baluchistan and the Mianwali district in Punjab. Why do they not have a single constituency to lead strength and character to their voice. When presented a democratic avenue, Pashtuns have long chosen secular parties with modern values over Islamists and definitely not the Taliban. So why is this democratic voice of Pashtuns being stifled ? Who are the natural enemies against this ? It is definitely not the USA, who has no special love for Islamists and who has absolutely no stakes in pushing the Pashtuns into a medieval tribal warfare. Why are the Pashtuns divided? to be fully functional on January 20, 2009. That's supposed to be a joke, but the truth is Obama isn't about to withdraw from Afghanistan. The Iraq war required the removal of the top ranks of the military. Those who had any knowledge or integrity had to go. The Afghanistan war however is seen by many of the mainstream 'realists' (Obama's appointments are largely students of history - cold war, oil, Vietnam etc, big change from the neo-con morons)as a justified war. You ask, "when did u change ur allegiance from mqm to tehreeki insaf." I have no allegiance to any political party in Pakistan. I personally admire people who are active philanthropists in Pakistan and support charities including Edhi, Shaukat Khanum, HDF, Hidaya, etc. Imran khan is my hero indeed inspite of his personal life flaws; he speaks the truth and is extremely brave/truthful/patriotic in his straight forward logical comments. But in the real world (*full of corruption and injustice) unfortunately this kind of pure mentality with lack of diplomacy leads to a complete disaster or a dead end. Remember history, remember Tipu Sultan what his fate was. I hope my philosophy is totally wrong and for the sake of Pakistan I pray Imran succeed in his quest for Justice, ameen. Imran looks better than others but thinking of making it top with such instability in views is impossible.What plan does he have to save his country people from taliban is US leaves?He is not an Obama anyday to base views on logic.Already pak army is filled with religious zealots-thanks to Zia.Political success is based on neutrality and ability to think beyond ones religion and nation in decisions.Imran needs great help here-but who will do that?May be then he will stop supporting talibana as he spoke recently and not be considered a idiot.It important to understand that current situation is out of hand of Pakistan as society and it needs international help to survive-This is not to disregard his social services which are inspiring in a nation filled with religious stink.